The eagerly (if not patiently) awaited update to the Android SDK was released yesterday. You can see the release notes here, or skip all that and download the good stuff from here. It's a substantial release, as you'd expect after such a long gap since the previous build (M5); I've listed some of the more notable changes below. The executive summary? Excellent new release that adds some maturity and stability to the early look version we've been playing with for so long. There's a lot of work for people porting existing apps over from M5, but the biggest downside is the loss two of the more interesting optional libraries (Gtalk and Bluetooth). Future SDK releases up to version 1.0 shouldn't have significant breaking changes. The maps, location-based services, and geocoding APIs have been much improved and tidied up. Interacting with the phone hardware (getting incoming call number etc.) is improved. The accelerometer and compass APIs are much more mature. Context menus and dialog boxes are included and improved respectively. The developer tools are much slicker. The new home screen and native applications are much nicer than M5, as are a lot of the default controls (Views). There have been a lot of breaking changes to behavior, required permissions, class names, and method signatures. Such is the price of progress. The loss of GTalk and Bluetooth is a bit of a blow, some of the most exciting mobile application possibilities come from those APIs. The signals coming from Google suggest this is "for now" not "forever". Most likely scenario is the security implications for both these APIs it was cheaper / easier to just leave 'em out for version 1 and come back to them later. 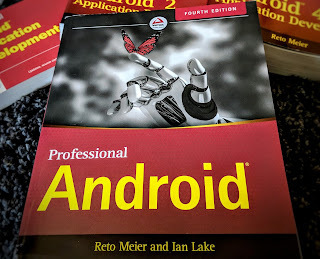 For those of you interested, Professional Android Application Development will be fully up-to-date on the (at least) this latest Android Beta.